In the 1851 census, Maria is shown as "Head of Household" so John Breeze must have died defore then. 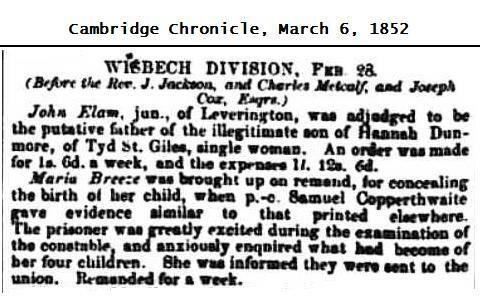 In a newspaper report from 1852 (see below) Maria "has been a "widow about seven years, and has four children living." This would suggest his year of death as "about 1845". In a further newspaper report from 1859 Maria said "her husband had been dead for fourteen years", i.e. since 1845. 2) 1864 Thomas Brown in Wisbeach, Norfolk. 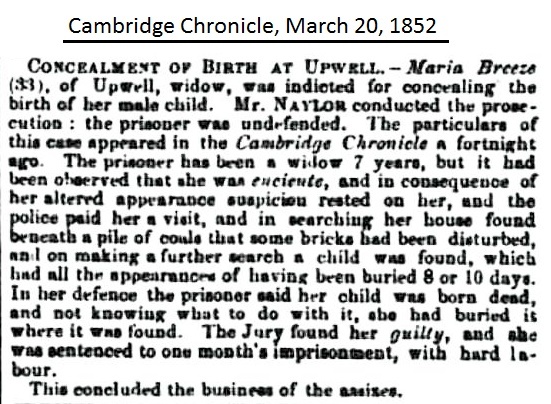 In 1852 Maria Breeze was charged with concealing the birth of a child and with it's murder. In February 1852 neighbours informed the police of Maria's suspicious behaviour. They had previously observed that Maria had been pregnant. When they later noticed her change of appearance, they were puzzled that no child was to be seen. The police searched Maria's house and discovered the body of a baby, hidden beneath a pile of coals. At the inquest Maria claimed the child had been dead on birth, and not knowing what to do with it, had buried it under the coals; the examining doctor believed the baby had died by suffocation. The Coroner, in his summing up, said that it was extremely difficult to tell if the child had been born dead or suffocated after birth. So Maria was therefore committed to trial only on a charge of concealment of birth. At her trial she was found guilty and sentenced to one months imprisonment with hard labour. I don't know if this is "our" Maria Breeze, as only a name is given, without any distinguishing details. And in 1859 Maria Breeze (this time definitely "our" Maria !) was in the papers again ! Jacob Wade, a farmer of Outwell, was summoned for the support of the illegitimate child of Maria Breeze. He denied being the father and in a further hearing, the case was found proved, and he was ordered to pay Maria 1s. 6d. a week. Jacob Wade appealed against the verdict, and in the following trial, he was able to prove that he could not have been the father. and surveyor of Upwell, was adjudged to pay for the respondant's illegitimate child. The respondant has been before the court before, some years since, charged with concealing the birth of a former illegitimate child. 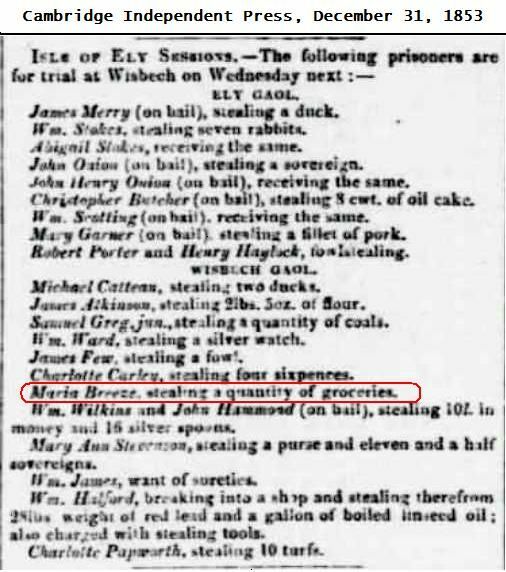 It was also proved that Maria Breeze had said that the child was not Wade's but she had sworn it for revenge. The name of the child is not mentioned in the newspaper reports, but Rose Elvina Breeze was born in 1859 and Maria's previous child was born in 1852, so my first thought was that Rose was most probably the child referred to here. However, the conception was allegedly during the "Wisbech Statute"*, in September 1858, and Rose was born in January 1859, so the dates don't tally. So which child did Maria mean ? 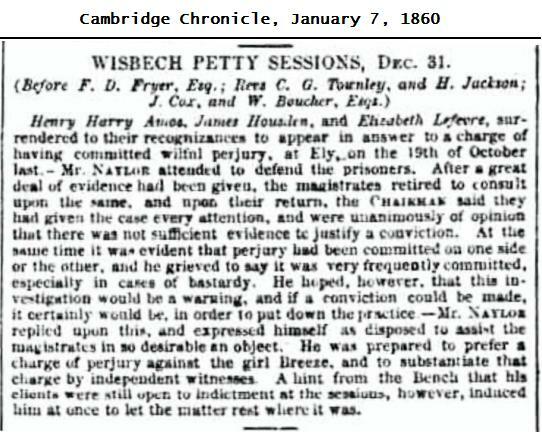 Following up on this report from the October Quarter Sessions, in December 1859 three people were charged with perjury. The "certain appeal" mentioned here is the appeal, above, by Jacob Wade against the bastardy order from Maria Breeze. And on Saturday at one o'clock… ? * Wisbech Statute Fair: an annual corn market and fair.